Kenan Thompson on "Saturday Night Live" fields questions about different blackface scenarios. It was a banner week for recognizing the sad reality that blackface is still, somehow, literally everywhere, from the pages of a politician's yearbook to an $890 sweater. 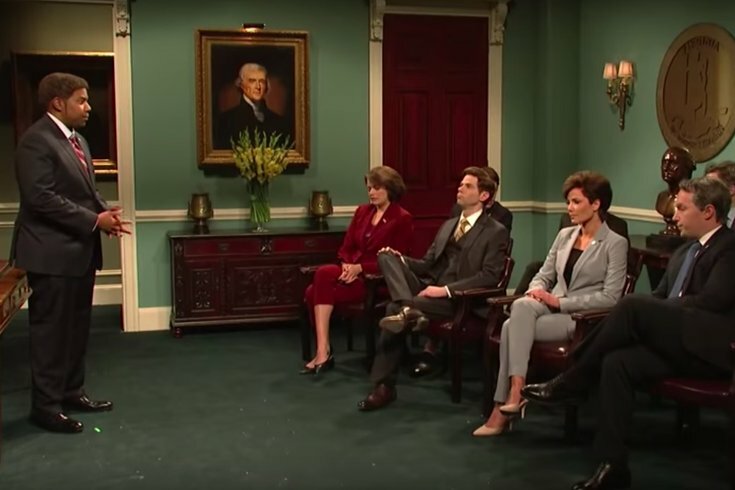 This week "Saturday Night Live," featuring host and musical guest Halsey, addressed the ongoing blackface controversies several times. In a sketch framed around this week's news of Virginia Gov. Ralph Northam admitting to wearing blackface, potentially photographed as such in an old yearbook, Kenan Thompson asks during a meeting at the Virginia State Capitol: has anybody NOT done blackface? The committee goes on to ask if it's okay to do blackface if it's part of a costume, or if that costume won a contest... the resounding answer is no. (It's too bad the show didn't realize this in 2000, when Jimmy Fallon wore blackface on the show to impersonate Chris Rock). During Weekend Update, Michael Che and Colin Jost continued to address the week's blackface controversies, including the viral Gucci sweater that appears to imitate minstrel blackface makeup. "I don't even want an apology, I'm way more interested in the racist journey," a flummoxed Che said. "As much as black people love Gucci, this is devastating. White women, imagine if you found out Lululemon was making MAGA hats." "SNL" returns Feb. 16 with host Don Cheadle and musical guest Gary Clark Jr.